SYNOPSIS: Recently banished, unfairly, by the school’s popular crowd, former “it girl,” Miranda Prospero, finds herself in a brave new world: holding dominion amongst a rag-tag crew of geeks and misfits where she works at the Hot-Dog Kabob in the food court of her local mall. When the worst winter storm of the season causes mall workers and last-minute shoppers to be snowed-in for the night, Miranda seizes the opportunity to get revenge against the catty clique behind her social exile. With help from her delightfully dweeby coworker, Ariel, and a sullen loner named Caleb who works at the mall’s nearby gaming and magic shop, Miranda uses charm and trickery to set things to right during this spirited take on Shakespeare’s The Tempest. REVIEW: I'm not a big Shakespeare fan because I never really took the time to understand his writing. In highschool, and even now in college, we didn't really discuss Shakespeare in depth. We were only able to discuss a few of Shakespeare's works, unfortunately The Tempest wasn't one of them. 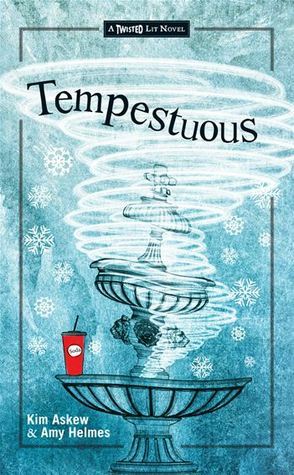 Tempestuous tickled my curiosity so even if I had no clue what The Tempest is about, I read it anyway. "Trapped in a mall." This book had me at the idea of being trapped in a mall. It's weird right, but it's always been one of my crazy scenarios. Assuming you won't get into trouble for taking things and messing the place up, I think it could be fun getting trapped in a mall... minus the creepy Twilight Zone effect of course. That's basically what I liked about Tempestuous, it's loads of fun! The whole story takes place in one day, inside a mall. What I liked about this is that because the story line is confined in one day and in one place setting, it's like the story was developed nicely as the story progressed. I love it when a story line follows Freytag's triangle (picture below) especially when it's a mystery because it builds tension at the right time and the resolution comes in smoothly. I think Askew and Helmes did a great job at keeping the readers hooked! I kept making guesses as to who the robber is but when it was revealed I literally gasped and said, "Oh. My. God." A bit dramatic, I know. Aside from the mystery, it was fun how the authors were able to balance the teen drama and crazy antics with the mystery. I liked how Miranda and Caleb fell in like considering how annoyed they were at each other most of the time. I liked how the authors were able to paint a really fun picture of all their pranks and activities in the mall after hours. And I liked how thrilling the mystery angle was. It had the potential of becoming messy because of the different angles but it wasn't - it was the right mix of everything. There's such a thing as "awesomesauce"
I've read a couple of reviews of Tempestuous now. I'm really looking forward to get my hands on this it and read it for myself! The idea of keeping the setting in one place, the mall, seems really interesting. Hey Heather, just followed you back. Thanks for stopping by!